This is Part II of a short series on artistic renderings of USS Constitution. Part I can be found here. USS Constitution‘s receiving ship days came to an end in the early summer of 1897. On June 14, 1897, Massachusetts Congressman John F. Fitzgerald introduced a resolution in Congress to authorize the repair of the ship so that she could be returned to Boston in time for her 100th birthday. After a two-day tow down the coast from the Portsmouth Naval Shipyard, Constitution arrived in Boston on September 21, one month before her centennial. A grand city-wide celebration occurred on October 21, 1897, marking 100 years from when she was launched at Hartt’s Shipyard in Boston’s North End. This June marks the 110th anniversary of “Old Ironsides'” first true restoration in 1906. As the aged War of 1812 icon embarked on a new era as an historic vessel, artists continued to find inspiration in the warship. While Constitution had undergone many rebuilds and refits throughout the 19th century, it is the work that began in the summer of 1906 that is considered the first official “restoration.” For this project the U.S. Navy was attempting to restore “Old Ironsides” to an approximation of her War of 1812 appearance. The receiving ship barn was removed, a lightweight sailing rig was installed, her upper bulwarks were reconstructed to look like the War of 1812 era, and 54 replica guns were cast for the spar and gun decks. The 1906-1907 restoration was essentially a cosmetic project where no serious structural issues with the ship were addressed. In 1925, a survey of Constitution revealed that much of her above-the-waterline framing and planking, both inside and out, was completely rotten. It had been 53 years since the beginning of the 1872-1878 rebuild in Philadelphia and the ship was in desperate need of restoration. Secretary of the Navy Curtis D. Wilbur appointed a committee to raise funds to save Constitution. 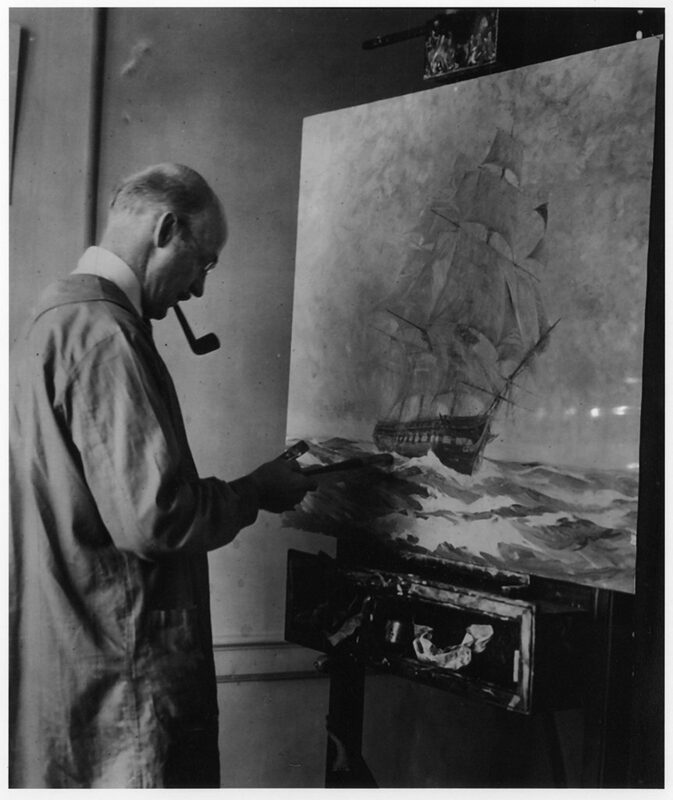 The Secretary commissioned Gordon Grant (1875-1962), an American marine artist, to depict “Old Ironsides” in her glory. The original oil painting, which currently hangs in the White House, was the prototype for more than 1 million lithographic prints sold to raise money for the 1927-1931 restoration. The intent was to present Constitution as the “eagle of the seas” and remind American citizens of the ship’s heroic past. The Gordon Grant painting is in stark contrast to Reuterdahl’s moody “resurrection” scene of just 20 years earlier. Grant’s original 1926 painting helped to raise hundreds of thousands of dollars for the 1927-1931 restoration. The USS Constitution Museum is fortunate to have 26 of these linocut prints, each showing a different element of the ship as she looked during the National Cruise. Boston-area artist and Massachusetts College of Art instructor Tom O’Hara (?-1984) also found Constitution‘s restoration periods inspiring. The ship was briefly dry docked from December 1963 to March 1964, when selective repair work on the cutwater, the live oak structure that was installed during the 1927-1931 restoration, took place. 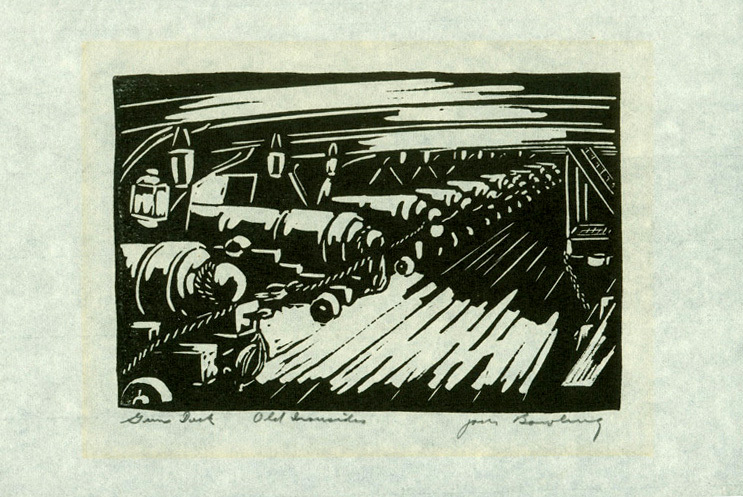 O’Hara employed loose, quick brushstrokes in his ink wash drawing of the ship’s port bow. His vantage point appears to be from the top of the dry dock, with a clear view of the work area. O’Hara likely sketched the scene on site, capturing the draped folds of the canvas protecting the ship restorers as they worked on the cutwater. In the 1960s, O’Hara participated in The NASA Art Program, which began in 1962. In this program, artists were employed “to present NASA’s discoveries and cutting-edge research to the public in a way that would be more accessible than complex scientific reports.” The Smithsonian National Air and Space Museum holds a collection of drawings O’Hara completed as a member of the program. In 1973, O’Hara returned to the Charlestown Navy Yard to document, with a series of pencil sketches, the beginning of Constitution‘s brief dry docking from April 1973 to April 1974. The vantage point in the scene below is from the steps on the port side of Dry Dock 1. With a few quick pencil strokes, O’Hara gives a sense of the massive height of Constitution, the depth of the dry dock, and the scale of the ship restorers as they go about their work. Cheslie D’Andrea, whom we introduced in Part I, created paintings that span Constitution‘s career across 200 years, from her construction in 1795-1797 to her restoration in 1992-1996. 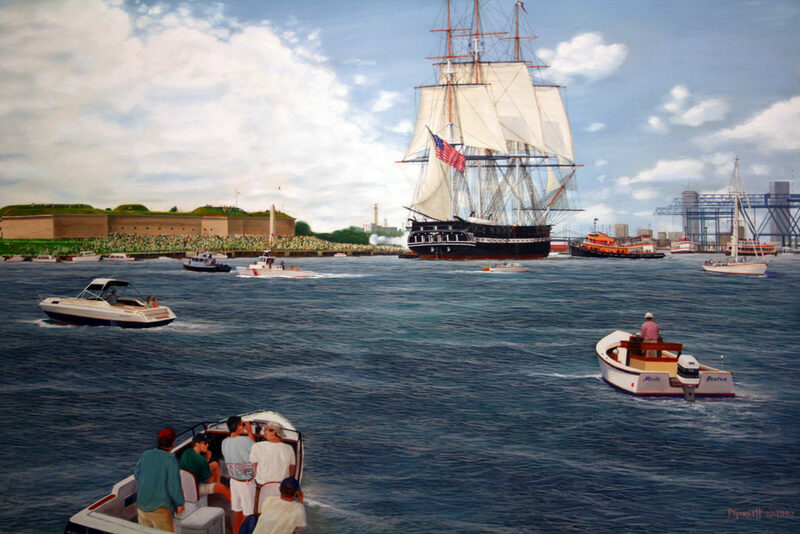 The acrylic painting below shows “Old Ironsides” being readied to enter Dry Dock 1 for the beginning of a major four-year rebuild and restoration in the 1990s. This work captures the early morning sunrise over Boston Harbor as the tugs and work boats are brought alongside the ship. The mood is quiet, reflective, and hopeful. Even though this is an unfinished work, with perspective gridlines still visible in the sky, D’Andrea included such details as the supporting wale shores floating in the dock ready to be pulled into place, the ship restorer in the foreground with his hard hat and life vest, and the flock of gulls wheeling around the tugs. This painting will be on display in the USS Constitution Museum’s upcoming Boarding Party & Collections Open House on May 25, 2016. At the conclusion of the 1992-1996 restoration, the U.S. Navy determined that USS Constitution was structurally strong enough to sail. On July 21, 1997, for the first time in 116 years, “Old Ironsides” sailed unassisted off the coast of Marblehead, Massachusetts. Just as Gordon Grant’s 1926 painting supported Constitution‘s first significant 20th century restoration, Paul Garnett’s imaginary depiction (seen below) celebrates the culmination of the last major restoration of the 20th century and the 200th anniversary of the ship’s launch. Garnett followed Constitution‘s sail off Marblehead from a small boat, taking photographs that he would later use as inspiration for his painting. Rather than strict reportage, he chose to use artistic license to create a scene in Boston Harbor that encapsulates the emotion, excitement, and celebration of the event. Today, USS Constitution continues to inspire artists of all mediums, whether she is floating majestically in Boston Harbor or temporarily dry docked for necessary preservation work.